Thanks David! Great to hear you enjoyed the article. Hi Trevor, thanks for the question. The question 'if I didn't already own this company, would I be buying it today' is a great clarifier. We don't want to over-trade around our estimate of intrinsic value due to tax and transaction costs. There should be some middle zone there. But excluding taxation impacts and transaction costs, I haven't heard a great example of why you should hold an asset at a certain price if you shouldn't buy it at that same price. Hi Eddie, thanks for the question. "decisions being driven by an asymmetric allocation of cognitive resources" This is essentially saying that buy decisions are given a lot of thought by fund managers and that helps them out-perform. However sell decisions are rushed, and not given enough thought i.e. they are not allocated enough 'cognitive resources'. This leads the sell decisions to under-perform. Thanks Mr T (great username). Great thoughts, and I agree that there is a big gap for further research. Regarding the search for some rules about the relationship between intrinsic value and an appropriate sell limit, my take is that it should be heavily influenced by investing style. If your approach is to buy deeply undervalued cigar butts then all your returns will come from a one-time closing of the gap to intrinsic value. That deep value strategy should sell as soon as the intrinsic value is hit, or even when the discount narrows significantly. On the other hand if you are buying undervalued growth businesses, it is very likely that the intrinsic valuation itself will increase significantly over time (if you are making accurate selections), in which case my approach is to be slower to sell purely based on valuation. Thanks Nathan! It's a challenge we all face. The worst is when investors deploy more capital in to a sinking thesis: investing quicksand. It's important to celebrate a smart sell at least as much as a brilliant buy. Interesting approaches Mark. The key for each investor is to find a considered selling process that suits their overall style. 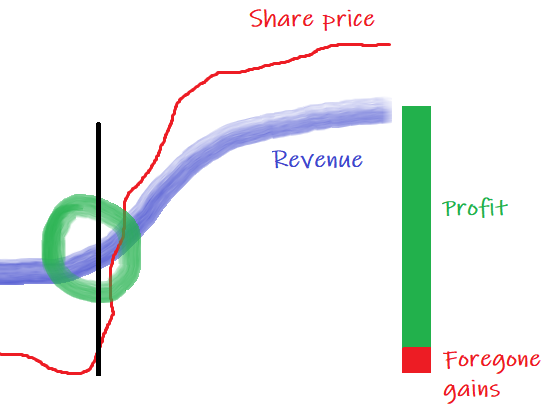 "Another method I use is to move my stops up as the share price increases. That way I prevent any loss and keep trying to creep my profits." - John Dorfman of Thunderstorm Capital outlines a similar approach to this in the book 'The Art of Value Investing'. Thanks Simon, great points. I also think it is a great idea about setting a margin of safety on the upside as well. It depends on the style of investing you are undertaking. But for fast-growing businesses with a lot of optionality, fundamentals can often surprise to the upside. We don't want to be shaken out in these cases, while also maintaining valuation discipline. Trimming a position can also be a prudent approach to position size management. We don't need to be 'all or nothing' with our sells any more than we do with our buys. Thanks James, and you are spot on about this approach being really applicable with small caps. Good luck on the hunt! Hi Adrian, great question. 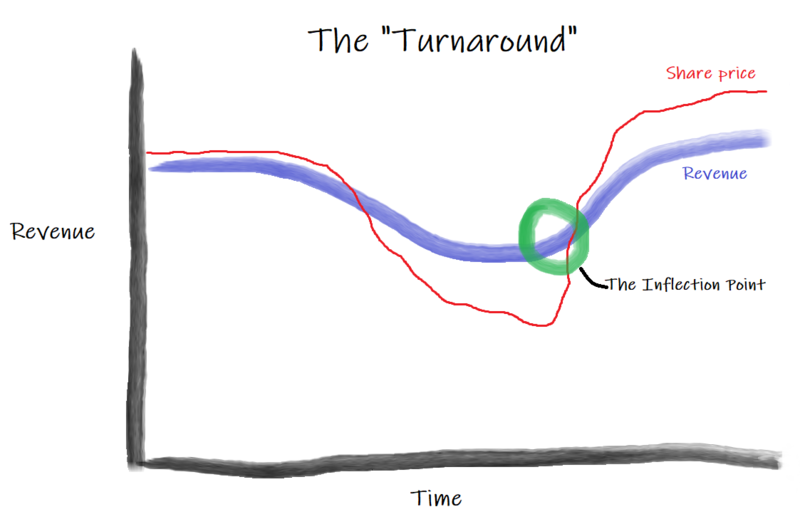 In my experience it typically goes like this: 1) Some publicly available information indicates that an inflection point has occurred. But that information may be difficult to access. It requires a lot of 'show-leather' research by the analyst (e.g. researching competitors, suppliers, customers), or it requires some superior analytical synthesis of publicly available information, or both. Neither is easy. The price may increase at this point, but it is limited since the information is not widely dispersed. 2) That inflection point starts to flow through in the subsequent financial statements from the company e.g. quarterly cash flow numbers, or half year reports. The price starts to increase further at this point, but typically not enough to immediately reflect the improvement. 3) Over time enough evidence is accumulated by the market and the narrative changes completely. At this point share price appreciation is rapid, and can often overshoot the fundamentals. Ideally we want to identify the inflection point in stage 1. But in my experience, in small companies it can be possible to identify an inflection point purely based on published financials (stage 2), and still make a tidy profit. This is because there is less analytical coverage, so it takes much longer for stage 3 of narrative shifts to occur. However even in large businesses it can take many months for a narrative to change enough to truly reflect the improvement. There is always some forecasting involved. We are assuming that the new improvement will continue. But that is a lot more certain than trying to forecast than an improvement will occur at all. Thanks Emanuel. Great point: valuation always matters. Fundamental inflection points typically offer a good opportunity for mis-pricing. However there will still be cases where prices are are already so inflated that subsequent returns are poor. Fundamental progress can always deteriorate as well. 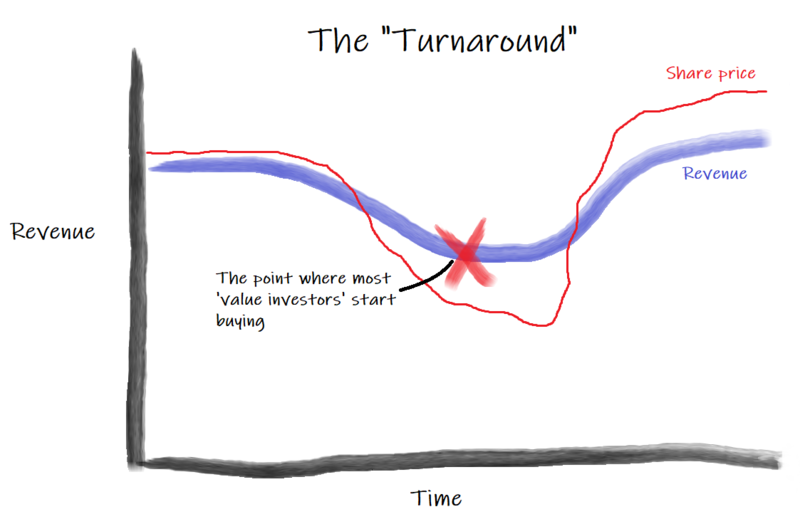 The price of market-thumping returns is eternal vigilance. Great question Ahmet. As I mentioned in the article, I try to rely on observation instead of forecasting wherever possible. 5G is a great example. One could forecast 5G will be a huge boon to the company, and potentially generate great returns. Or we could wait until evidence that the 5G rollout is already gaining traction, and already improving the company's overall fundamentals (and offsetting other headwinds). My preference is to wait until the turnaround is already underway. You miss some of the upside by doing so, but your hit-rate is much higher, you avoid the worst blow ups, and your average holding period is much shorter (thereby boosting annualised returns).